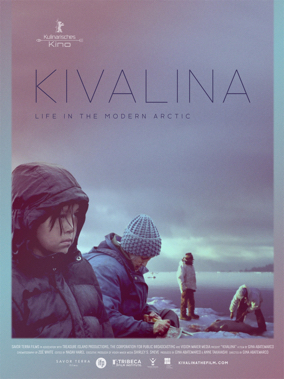 Kivalina is a visually stunning meditative journey set in a tiny indigenous village 80 miles north of the Arctic Circle. Life for these self-proclaimed Eskimos is simple, but certainly not easy alpha males on skiffs brave turbulent seas to hunt walrus with spears; machete-wielding elders chain-smoke while slicing-and-dicing, divvying up the coveted blubber and distributing it evenly amongst the group. They sing church hymns, play bingo and pray to Jesus about his oceans, which are steadily melting and creeping in all around them. In Kivalina there are no debates about climate change. The evidence is everywhere for anyone who cares to see. Director Gina Abatemarco skillfully crafts a balanced narrative devoid of politics or manipulation. Kivalina doesnt tell its audience anything, but shows us everything. This is the final frontier: native communities are being cast aside, left on their own to ponder the inevitable. How long before this centuries old village breaks off and quietly disappears into the sea? Gina Abatemarco is a New York-based director and producer who creates cinematic stories around food, culture and the environment. When not filming, she is active in New York's sustainable food movement and researches original food cultures. She has cooked at the American Academy in Rome for Alice Waters' "The Rome Sustainable Food Project" and has collaborated with Slow Food. She is a graduate of the Tisch School of the Arts Film & TV Program, where she co-founded the Fusion Film Festival in 2001, the first festival to celebrate female filmmakers at NYU. KIVALINA - trailer from Gina Abatemarco on Vimeo.